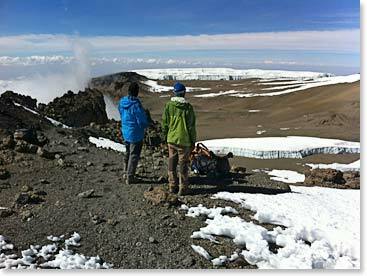 Berg Adventures started the year right on Kilimanjaro. 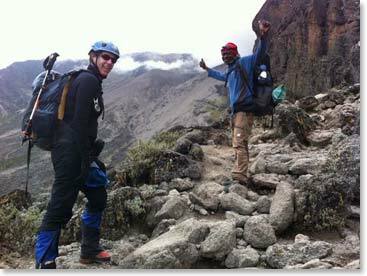 Climbers Tim, Terri and Rafael all made it to the summit of Africa’s highest mountain this January. Ascending along the Lemosho Traverse, the team spent nine days on the mountain and summited the 19,430ft/5,895m peak on Day 8 after spending a night in the crater at 18,700ft/5,700m. We enjoyed listening to their enthusiastic dispatches each morning in the office; they certainly sounded like they were having a great time. Congratulations Team! Upon returning home, Tim shared these great videos with us. The team is welcomed to camp with singing and dancing. Maybe we should start a Berg Adventures choir! When the team reached the trailhead at the bottom of the mountain, a buffet lunch and a team of acrobats were waiting for them. A big thanks to Tim for sharing these videos and to the rest of the team for sharing their experiences too. 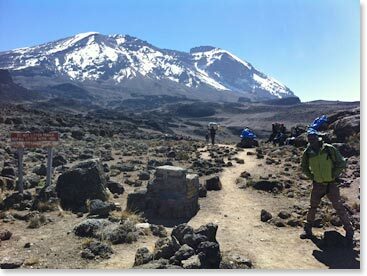 Start planning a Kilimanjaro adventure of your own. Visit our Kilimanjaro homepage or contact our office today! 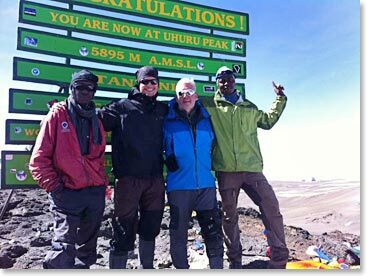 This entry was posted on Wednesday, February 29th, 2012 at 11:18 pm	and is filed under Expedition News, Kilimanjaro.